It is difficult to describe the scale and majesty of the Temples of Angkor, it is certainly possible to put into words the aura of mystery and atmosphere of the complexes. 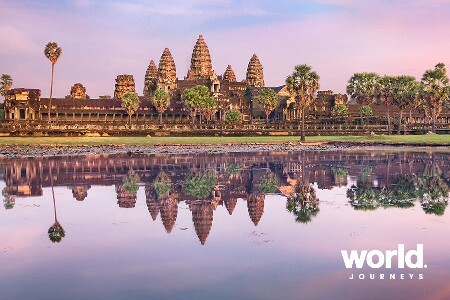 Built by kings who were said to be incarnations of the gods, these incredible temple-cities were once home to hundreds of thousands of people, each built to outshine all its predecessors in scale and grandeur. Day 2: Siem Reap (B,L) Just one kilometre north of Angkor Thom there are some very unique temples with an important history. They form what is called the Grand Circuit and basically hug the shores of North Baray (a Khmer reservoir) which until recently was dry, but has now been refilled with water to resemble Khmer times. 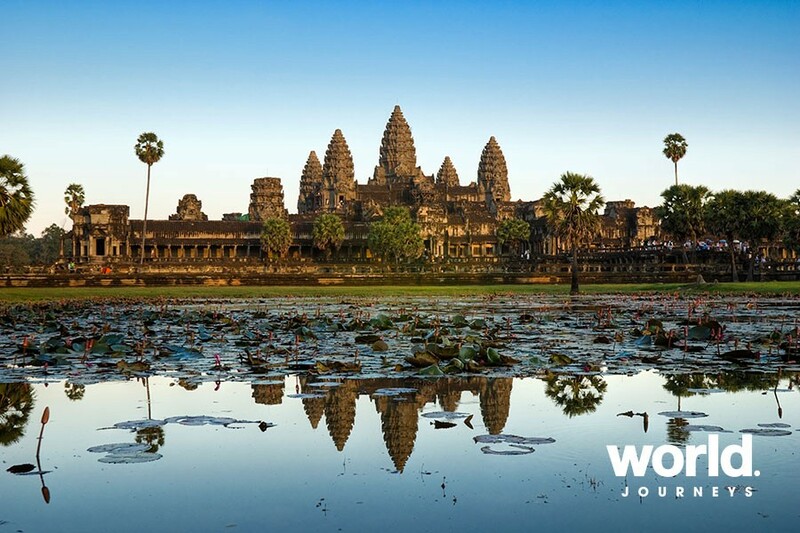 The temples of the Grand Circuit are generally not as crowded as others in the Angkor complex. 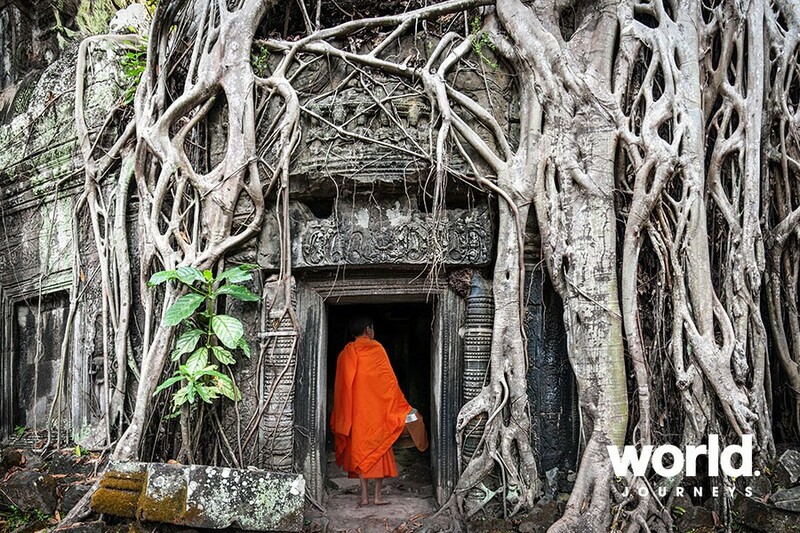 Start your exploration with a transfer to Preah Khan Temple. This massive temple (140 hectares) was built in the 12th century by King Jayavarman VII as his home whilst he was building his new Capital Angkor Thom, it is said that it once housed over 100.000 officials and servants. Continue to Neak Poan, an artificial island with a Buddhist temple on it. 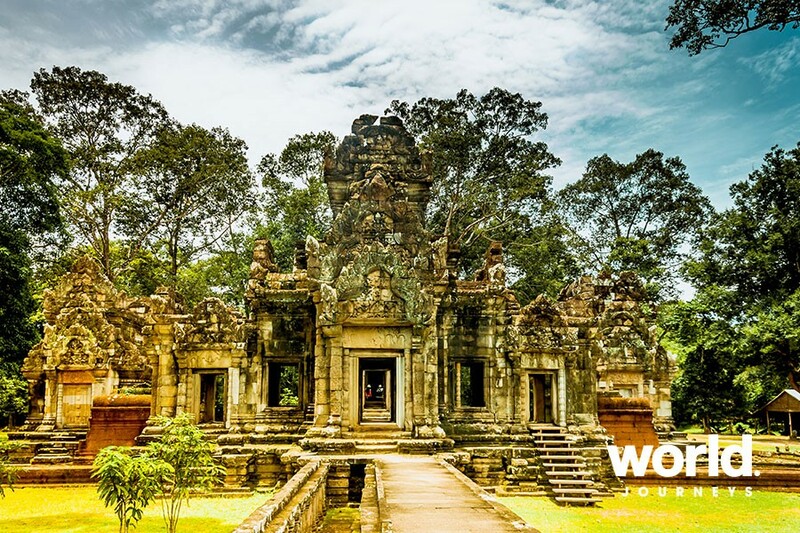 It is believed it functioned as a hospital during King Jayavarman VII's reign. Next you will visit one of the smaller temples, Ta Som, dedicated by Jayavarman VII to his father. There are some very well preserved bas-reliefs in this temple (mostly Apsara), one of the best is on the northern side of the grounds surrounding the temple. Lunch at a local restaurant before continuing to Banteay Samre, a structure often compared to a mini Angkor Wat. Built in the 12th century, the temple served as a Hindu temple. Next stop is Eastern Mebon. The main features of this temple are the statues, large elephants and lions in almost perfect condition. 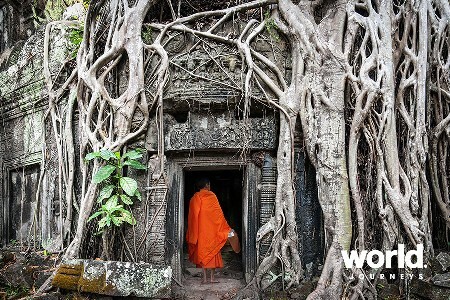 These are rare in the temples of Angkor Park and they are very impressive. Originally the temple would have sat on an island in the middle of East Baray, which is now dry. A short distance further is your final stop, Pre Rup. This is an impressive temple, of the classic temple mountain design and in a very good state of repair. Because of the name of the temple, many historians believe it was a crematorium or funeral site. Both Eastern Mebon and Pre Rup were built by the Hindu king Rajendravarman II and date to the mid 10th century. Your road back to Siem Reap follows the shore of Sras Srang, which is the former Royal bathing pool of the Khmer Kings and is now a body of water that measures 700 by 350 metres. 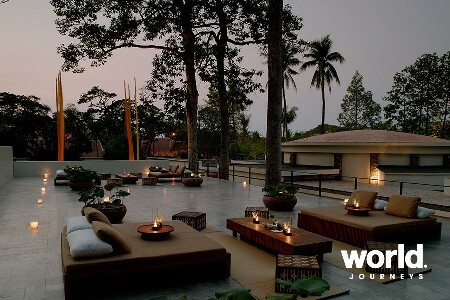 Depending on the season and your inclination, you will either enjoy the sunset from the East terrace of Sra Srang or the summit of Pre Rup. Day 3: Siem Reap (B,L) Start the day with a transfer to visit the ancient Royal city of Angkor Thom with its centre piece, the Bayon temple. 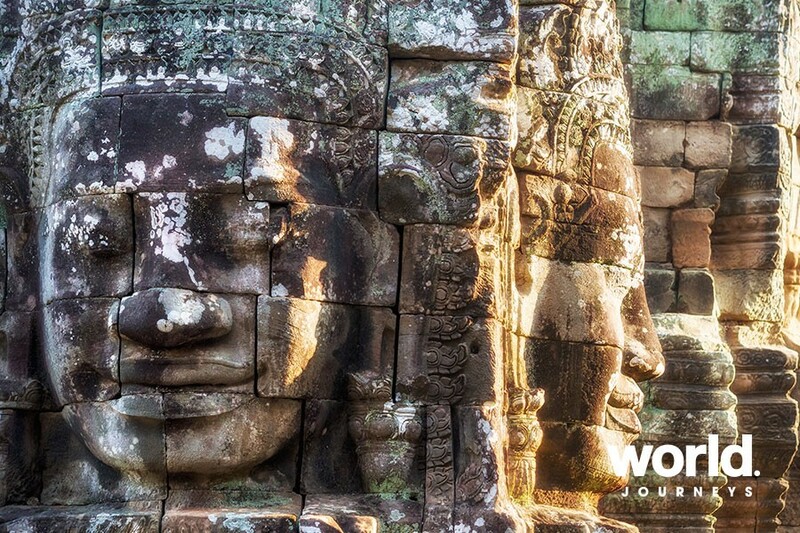 At first glance, it may seem like a shapeless mass of stone, but further scrutiny reveals towers with enigmatic faces of former King Jayavarman VII looking into every direction. Continue your exploration with a visit to the Terrace of the Elephants, which served as a platform from where the King could welcome back his victorious army. Attached is the Terrace of the Leper King which holds detailed carvings winding along a narrow passage way that leads to the Baphuon complex. Head back to Siem Reap to rest and to enjoy lunch at Sala Bai (Note: Sala Bai is usually closed during national holidays and for the entire month of April over the Khmer New Year holiday.) 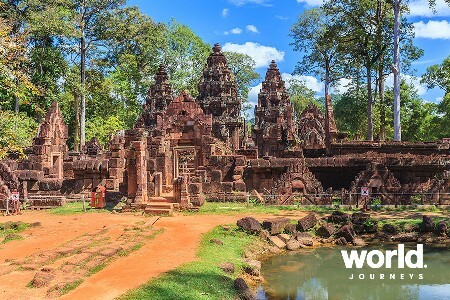 In the afternoon, visit the jewel of Khmer art, Banteay Srei temple, located one hour from Siem Reap. This red sand-stone temple is one of Angkor's most significant structures as its walls are decorated with elaborate carvings in an amazing state of preservation. Transfer back to your hotel late afternoon. 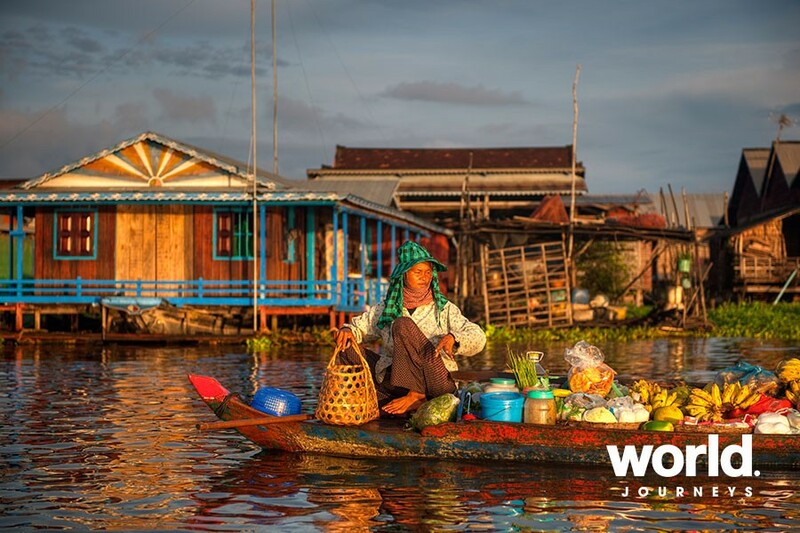 Day 4: Depart Siem Reap (B, L) Drive to the floating village of Kampong Khleang, one of the largest settlements on the Tonle Sap Lake. 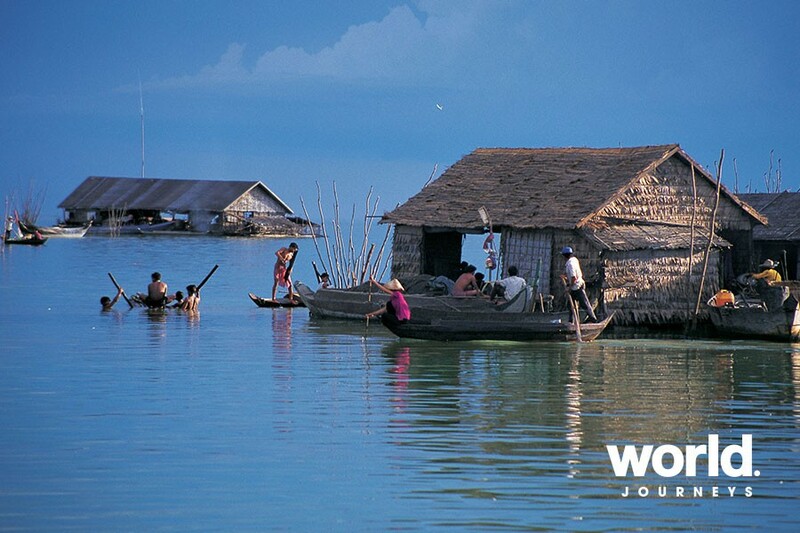 Living on water is an art the Khmer people have mastered over the course of time. 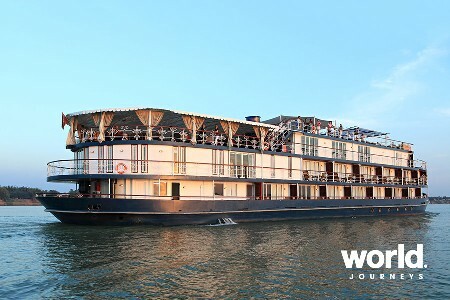 Board a local boat and visit a floating house where a catered lunch is set up for you. Observe the local customs and talk with your hosts about the differences they face living on the water. Continue after lunch exploring the small island, which is home to a bustling market, a pagoda, a school and a health centre before returning to Siem Reap (It is advisable to wear sturdy, walking shoes with a decent grip). 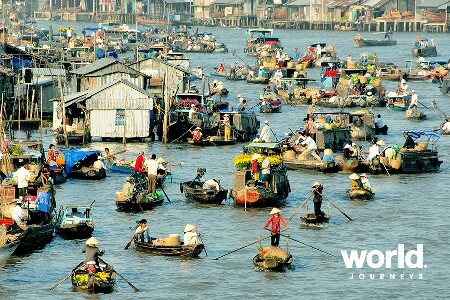 • Surcharges apply over Christmas, New Year, Chaul Chnam Thmey, and Cambodian New Year. Enquire for details. If travelling during Chaul Chnam Thmey or Cambodian New Year, many shops, restaurants & businesses are closed during this period or may operate on a limited schedule. 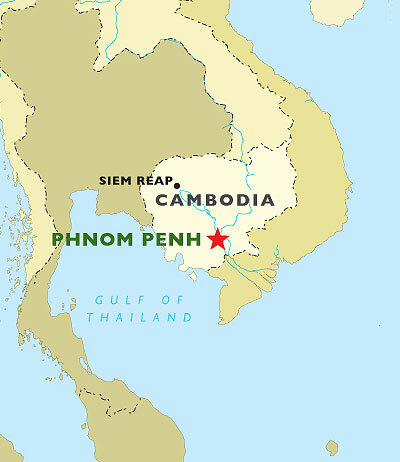 Departing Phnom Penh or Siem Reap by road may be difficult during this period since many locals will travel over the holiday as well. Flying between cities should be fine, although please allow for some delays and more traffic than usual. Local attractions in the countryside and around Phnom Penh will be crowded with domestic visitors, who usually travel with their entire family. It is recommended that during the Khmer New Year period, smaller local attractions like streams, waterfalls and parks are avoided as they will be very overcrowded with locals on holiday.